Yesterday the girls wanted "Frozen Hair". Talia wanted "Anna Hair" and Katrina wanted "Elsa Hair". Once you've got french braiding down, you can get a little bit more creative with how and where you place them on the head. (Here's a little inspiration for braiding variations, no matter what skill level you're at- it's fun to look at how young my kids were in some of those pictures!). For Talia I did two regular braids (but by that time, we had run out of time for pictures and had to hurry to the bus stop!) and for Katrina, I did this wrap-around side-braid and was really happy with it! I have learned that her hair will NOT stay in a braid by itself very well (it slips right out and has more short pieces than Talia's hair has), so I sprayed it well with hair spray. We have some sparkly hair spray left over from Halloween, so that is a favourite with the girls, especially when trying to channel a Disney princess/queen!! Do you have Frozen fans at your house? I love your Elsa-inspired braid, and I'm sure your daughter is in heaven. So adorable! I'm sure your little Elsa was delighted with her 'do. I really need to brush up on my braiding skills. Wow! You have your braiding down. It looks great. I have never learned how to french braid so my oldest has to braid my younger daughters hair. 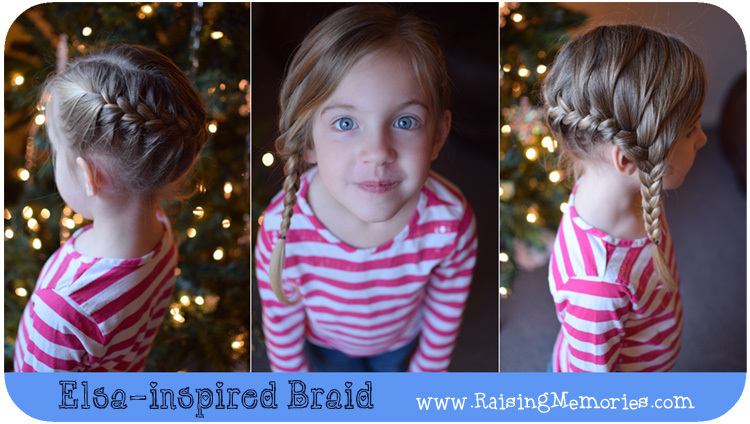 This Elsa inspired braid would look so cute on my niece. I like the way it looks and how adorable it looks! I have Frozen fans at my house! I have a niece that would love to have her hair braided like Elsas. She is a huge fan of Frozen. The pictures are great.